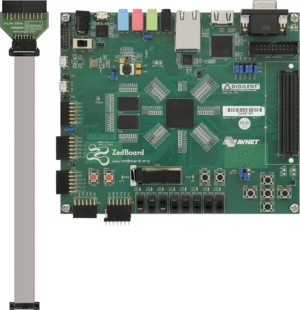 The Xilinx ZedBoard is a complete development kit for the Xilinx Zynq7000 SoC. The Xilinx Zynq7000 is a high-end SoC which incorporates a dual core Cortex-A9 (2x Cortex-A9) and programmable FPGA logic on-chip. Please note that for the device selection in J-Link Commander, quotes are needed around the device name (as shown in the screenshot below). This is due to the nature of the Zynq7000 device names, containing spaces. Apart from that, there is nothing special to be taken care of. 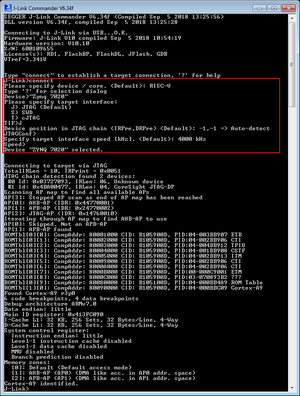 Note: The device selection is mandatory to make sure that J-Link applies the correct connect and reset sequences to the Zynq 7000 series devices. By selecting "generic Cortex-A9" correct functionality cannot be guaranteed. The ZedBoard provides a Xilinx specific 14-pin debug connector. In order to connect J-Link to this board, the J-Link Xilinx adapter is needed. This page was last modified on 1 October 2018, at 11:46.